Rectangular Adjustable Hygrometer Discounts Apply ! Place the hygrometer in the Boveda Calibration kit or in a Ziplock with a salt sample. After 24-36 hours read the hygrometer and determine the inaccuracy if any. For this example we will say it displays 70% and the test standard is 75%, this tells us the hygrometer is displaying 5% low. Remove the hygrometer from the bag. Turn the setting knob (the large round knob) one click for each percent off, in this case turn it 5 clicks clockwise. Very IMPORTANT, while turning the knob the display will NOT change in conjunction with the number of clicks. 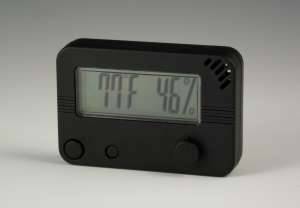 The display may move but that is just due to the hygrometer reading and adjusting for the room rh that you are in. Turning the adjustment knob will NOT affect the display reading. After turning the adjustment knob press the reset button (the small recessed button on the front of the hygrometer). This resets the hygrometer for the inaccuracy that you have. Pressing this button will not make the display change. Return the hygrometer to the Boveda Calibration kit or the ziplock with salt sample. Let stand for 24-36 hours and check the accuracy of the hygrometer. If it is still off by a little repeat the above steps, if not put it to work.